Kevin Perz has sent three unsuspecting teachers checks over the years. camera (Ashtin Hart) Marilyn Mecham ended up seeing her former student, Kevin Perz, just says after he sent her a check for $10,000. Here they are pictured on Jan. 14, 2015. One man in Kansas has been paying it forward with his high school teachers, one check at a time. 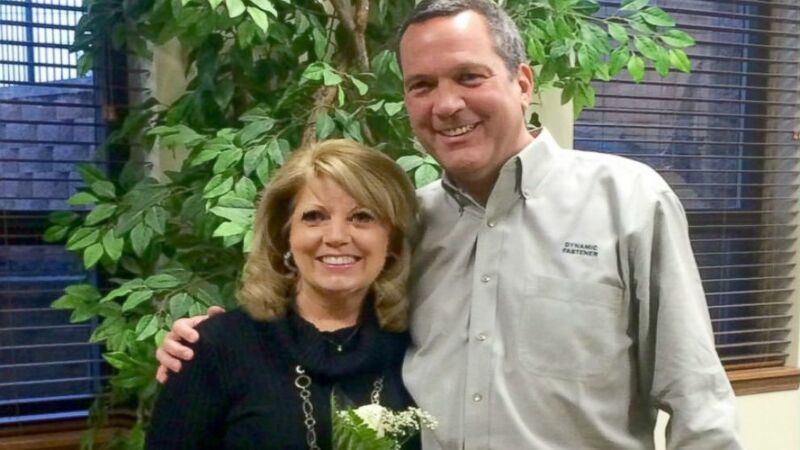 Kevin Perz graduated from Parkway Central High school in Missouri in 1977, but he hasn't forgotten to show his appreciation for special teachers that impacted his life there. The latest teacher who received an unexpected gift was Marilyn Mecham, who he had been trying to track down for years. After finally finding her current phone number, the pair chatted by phone in January, a move that Mecham told ABC News was special enough. "I was so appreciative to have somebody spend all that time looking for you to tell that you meant so much in their life," said Mecham, who had Perz in her co-ed food class, which was similar to home economics, during her first year of teaching. 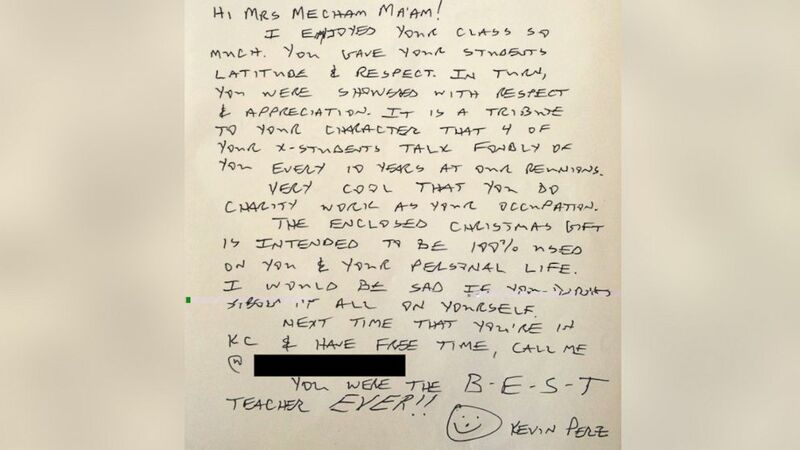 (Marilyn Mecham) Kevin Perz sent this letter to his high school teacher with a $10,000 check enclosed. The phone call moved Mecham that she posted on Facebook urging others to take the time to make a similarly "powerful moment" in someone's life. Little did she know that the call was just the first half of the gift. Two days later, on Jan. 9, she received a handwritten letter from Perz with a $10,000 check inside. "She called me Monday she said she got it Friday and she spent the whole weekend crying," Perz told ABC News about Mecham's reaction. Perz, who now lives in a suburb of Kansas City and works in construction distribution, first started sending checks to former teachers in 1992 when he sent a $5,000 check to his calculus teacher. The next came two decades later, when he sent a $10,000 check to his business teacher. And this year, it was Mecham's turn. She taught the school's co-ed food class, where students worked in groups and cooked different dishes that they then "wolfed down at the end of class." "Everybody in their life can always think back to someone in their life who had an impact, if it's a teacher or a boy scout leader or anyone," Perz said. In the note to Mecham that had the $10,000 check enclosed, Perz was very specific about how the money should be spent, writing that it "is intended to be 100% used on you & your personal life. I would be sad if you didn't spend it all on yourself." 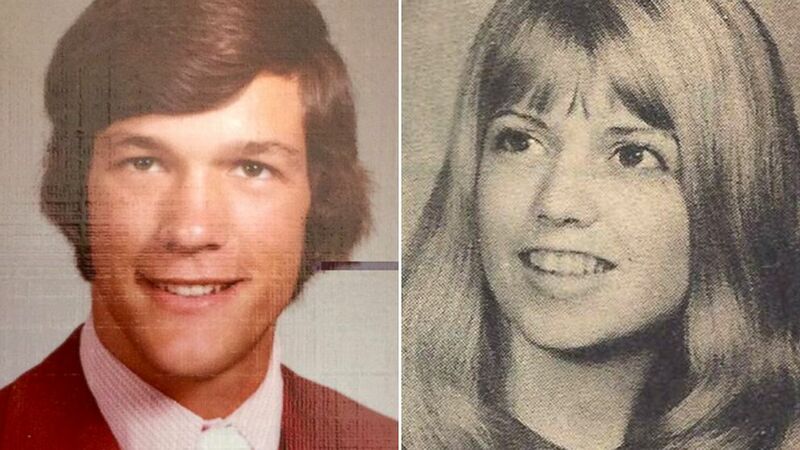 (Marilyn Mecham) Marilyn Mecham, right, was in her first year teaching when she had Kevin Perz as a student, both pictured here in undated high school yearbook photos. Mecham told ABC News that she wants to "honor the gift" and the terms attached, and though no plans have been cemented yet, she hopes to travel to her ancestral homelands of Norway and Sweden. "Gratitude is something in this society today that we just don't do enough of," Mecham told ABC. "It's made me stop and think who do I want to thank," she said, noting that she's not alone. Since she shared the story for the first time last week, she has received more than 500 emails and Facebook messages from others sharing their own stories about meaningful teachers. "Whatever I did my first year of teaching was quite unremarkable but what Kevin has done is really remarkable," she said.